Samsung Galaxy S4 UK release date, specs, features and video | What Hi-Fi? UPDATE: Samsung Galaxy S4 review now online! UPDATE: Samsung has launched the Galaxy S4 smartphone, and with a UK release date of April 26th, you won't have long to wait get your hands on it. The official price has been confirmed as £629.95, with pre-orders now open for the phone in the UK. We have all the specs, pictures and details on all the new features. Compare the new Samsung Galaxy S4 to the Galaxy S3 and you'll see it's slimmer and smaller in width, the same height, and slightly lighter. The Galaxy S4 dimensions are 136.6mm x 69.8mm x 7.9mm, compared to the Galaxy S3 which is 136.6 x 70.6 x 8.6mm. The Galaxy S4 weighs 130g to the S3's 133g. The phone will be available in 16, 32 and 64GB incarnations. There's also an SD card slot for expanding the memory. It's available in black mist or white frost. With many of the Galaxy S4 leaks and rumours proving to be true, Samsung revealed a phone with a 5in full HD Super AMOLED screen. Built using Corning's latest Gorilla Glass 3 with Native Damage Resistance, this cover glass promises improved damage and scratch resistance, and reduced scratch visibility. A full HD 1920 x 1080 resolution 5in screen means the Galaxy S4 has a pixel per inch (PPI) density of 441. 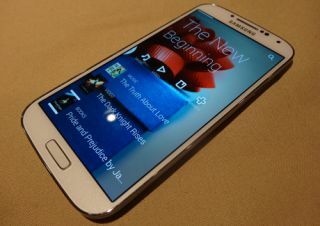 The Samsung Galaxy S3 by comparison had a 4.8in, 1280 x 720 screen and a PPI of 306. The Galaxy S4 has 3G, HSPA+ connectivity and also support for 4G LTE networks, which was missing on the Galaxy S3, plus WiFi. EE, the UK's first 4G network, has already said it will be carrying the Galaxy S4. Vodafone and Three will also offer the Galaxy S4, but there's no word as yet on O2. Interestingly, there will be two different models offered with different processors for different markets. The UK model will have a 1.6 GHz Octa-Core processor. The US model has a 1.9 GHz processor. The Galaxy S4 will shop with Android 4.2.2. (Jelly Bean), which at the time of writing is the latest version of the Android operating software, and has a 2600 mAh battery. The Samsung Galaxy S3 settled for a Quad-core 1.4 GHz processor, which was top-of-the-range at launch, currently runs Android 4.1.2 (Jelly Bean) OS and had a 2100 mAh battery. Samsung is focusing on a host of new features. Smart Pause will stop video playback when you look away from the screen and resume when you turn back. Smart Scroll meanwhile allows you to tilt the phone to scroll up and down web pages. Air View and Air Gesture meanwhile allow you to control the Galaxy S4 without touching the screen. Air View gives you a preview of emails, calendar notifications and more by hovering over the screen, while Air Gesture allows you to swipe above the screen to skip tracks, move through pictures and more. The Galaxy S4 also interestingly has an IR LED remote control for controlling TVs, plus MHL 2.0 connection for getting videos on your screen, plus wireless technologies in the form of NFC and aptX Bluetooth 4.0. Other new features include Group Play, allowing you to connect multiple Galaxy S4 phones to play and share music, an S Health app and a new, better integrated Samsung Hub for all your media content. There will also be a range of accessories at launch, including S Band, a Bluetooth GPS and tracking band. The likes of S Voice, Samsung Link, Screen Mirroring, ChatON and WatchON are also on board. The Samsung Galaxy S4 price has been confirmed as £629.95, with pre-orders now open for the phone in the UK. The Galaxy S4 has a UK release date of April 26th, so that's the day to circle if you want to be one of the first to get your hands on one.